Mazda to check steering of 10,000 cars | What Car? Mazda is contacting the owners of more than 10,000 3 small family cars and 5 MPVs to offer free checks and repairs on the power steering system. The manufacturer has discovered that particles in the power steering pipes could cause the system's electric pump to shut down. Although power assistance would be lost if the pump shut down, drivers will still be able to steer the car, albeit with extra effort. There have been two reported cases of the failure in the UK. Mazda says there have been no reported accidents or injuries. 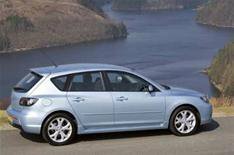 The manufacturer is contacting the owners of 10,268 1.6-litre diesel and 2.0-litre petrol Mazda 3s, and 1.8- and 2.0-litre petrol Mazda 5s built between April 2007 and November 2008. Fixing the pump and associated parts will take between 90 and 110 minutes, and will be carried out free of charge.